A recent article in Forbes describes how Patagonia, one of the early thought-leaders on sustainable business practices, and Walmart, are partnering to help Walmart move up the sustainable business learning curve fast. The article emphasizes the need for not just being sustainable inside the business, but up the supply chain as well. This initiative is being driven by Walmart CEO, Lee Scott, working with Patagonia’s CEO, Yvon Chouinard. Walmart is assessing things like how much water is consumed in the manufacturing process of a product, whether pesticides are used, impact on climate change, energy efficiency, etc. Walmart wants to place a scorecard on its store goods that rate products on eco-friendliness and social impact. 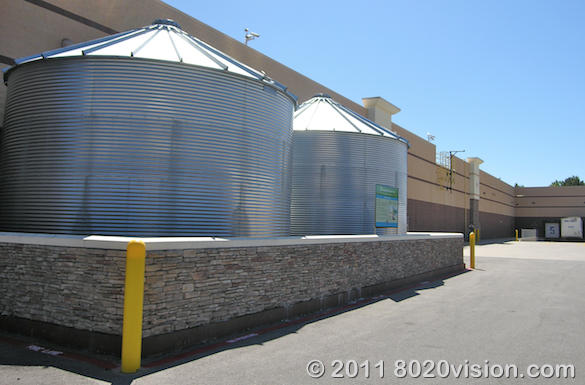 Walmart is evaluating its suppliers and will give preference to those who best comply. Patagonia has helped others, including Nike, Gap, REI, and North Face. Nike has gone on to form GreenXchange, a consortium of ten companies (among them, Yahoo) that will trade eco-friendly intellectual property. If a business confines their view of global issues to within their own business, they might think that climate change, water scarcity or high energy costs don’t impact them. 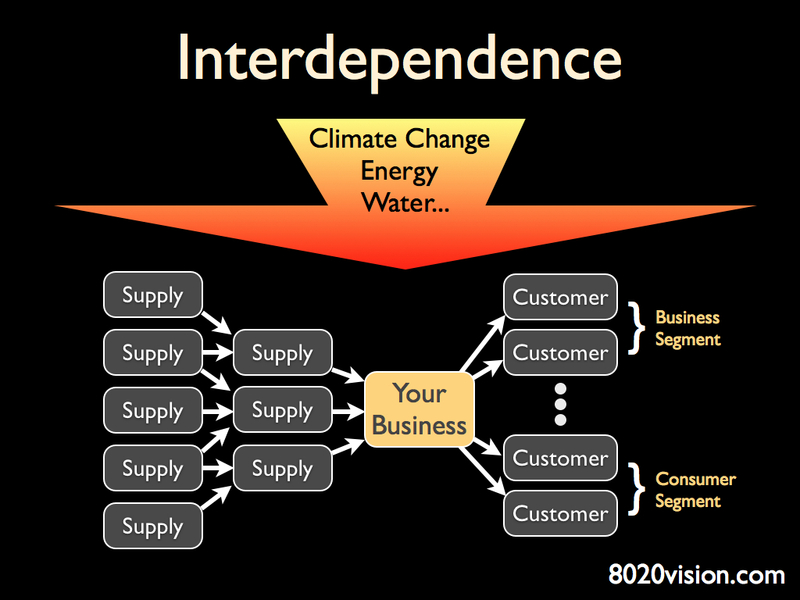 They might say “Well, we don’t use much water, so that’s not an issue for us.” But if the view becomes more expansive to include the supply chain and the customer, they find increased risk to “business as usual.” Everyone interdepends on everyone else. Just as the proverbial rising tide lifts all boats, if the tide falls for one, it falls for all. Water tables are falling rapidly in China. If a production plant in China, making product for Walmart, depends on water for the production, and the price of water suddenly rises, or access is limited by government edict, that impacts Walmart cost of goods and product flow. If Walmart customers can’t afford to buy as much because they are spending too much on energy bills and gas expenses because the price of oil is at $120 a barrel, Walmart top line revenue growth declines. Even if a business isn’t selling directly to “the consumer,” there is risk. If a company has businesses as a customer segment, they must understand how those businesses will be impacted. For example, if Walmart customers choose to spend less money at Walmart because of rising energy prices or fear of losing a job, Walmart will place less orders with their vendors and vendor order volume will fall. So consumer wellbeing matters to vendors all the way up the supply chain. Walmart is the biggest retailer in the world. They are taking the long view and understand the interdependence of their success with the health of their supply chain and customer base. Mitigation – Understanding what impact global issues will have on the business and creating adaptive strategies and tactics to prepare. Shareholder value is protected. Innovation – As a business understands the global trends and challenges, they can innovate solutions that will have real value for their business, supply chain and customers, and beyond the, open new markets and opportunities. Shareholder value is increased. Advocacy – Are the steering directions a business gives to representative associations, lobbying firms, chambers of commerce and state and federal representatives in alignment with new found adaptive strategies and tactics? Thinking like Walmart – What can a business do to ensure a healthy world? Perhaps we should call it the The New Trickle Around Economy! More on this in a future post. 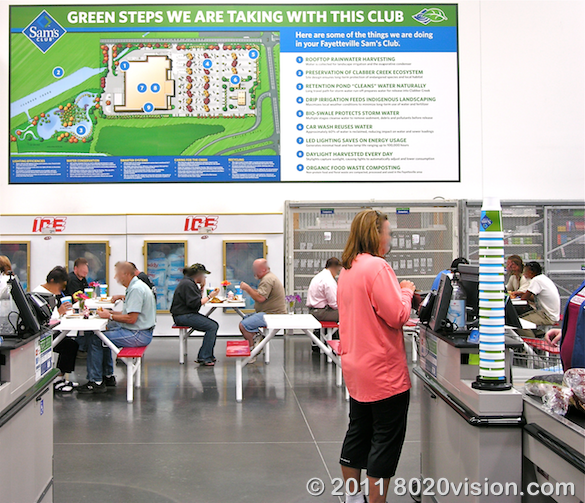 For now, here are some photos I took while visiting Walmart headquarters, in Bentonville, AK, for a book I am writing on sustainable business strategies. 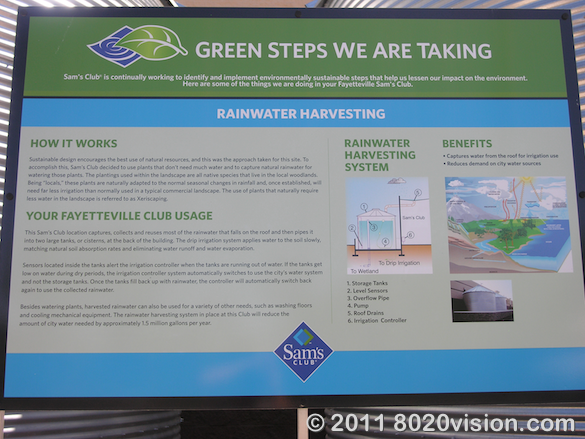 These pictures were taken while touring one of Walmart’s flagship stores in Fayetteville, AR. 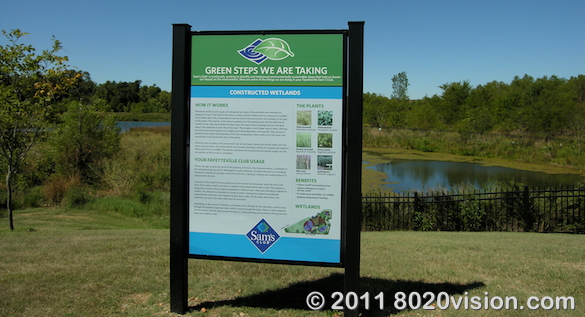 Walmart store green steps program, wetlands for catching run-off, and purifying it naturally. Thank you for visiting 8020 Vision – connecting the dots between global challenges and sustainable solutions. "We are shaping the world faster than we can change ourselves, and we are applying to the present the habits of the past." When Does the Wealth of a Nation Hurt its Wellbeing? Which Energy Industries Would You Subsidize?